Experience your music and movies the way they were meant to be heard with crisp highs, full mids, and thundering bass. 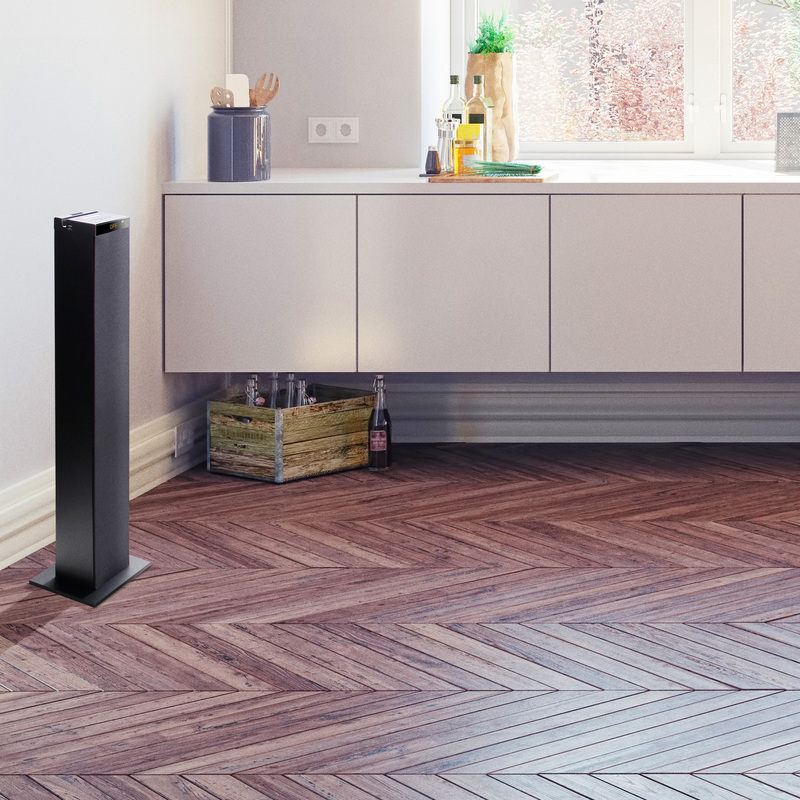 Enhanced with a built-in powered subwoofer and 120W peak power, the BlueSYNC STW brings your home audio to life with booming sound and amazing clarity. 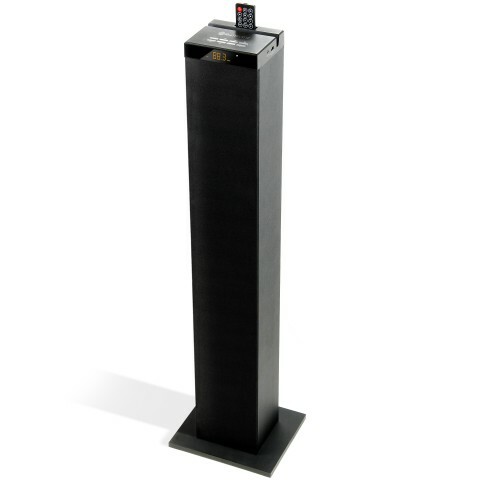 With its sleek vertical unibody, the STW sound tower perfectly accents smaller living spaces without taking up much space. 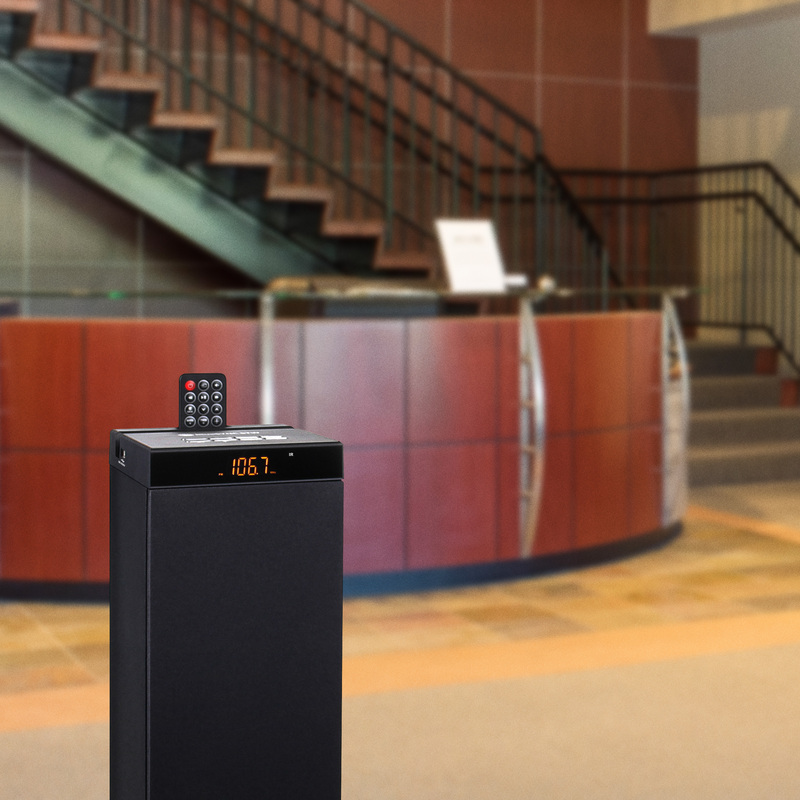 The floor speaker looks great in lounging spaces, apartments, dorms, studios, offices, and waiting areas. 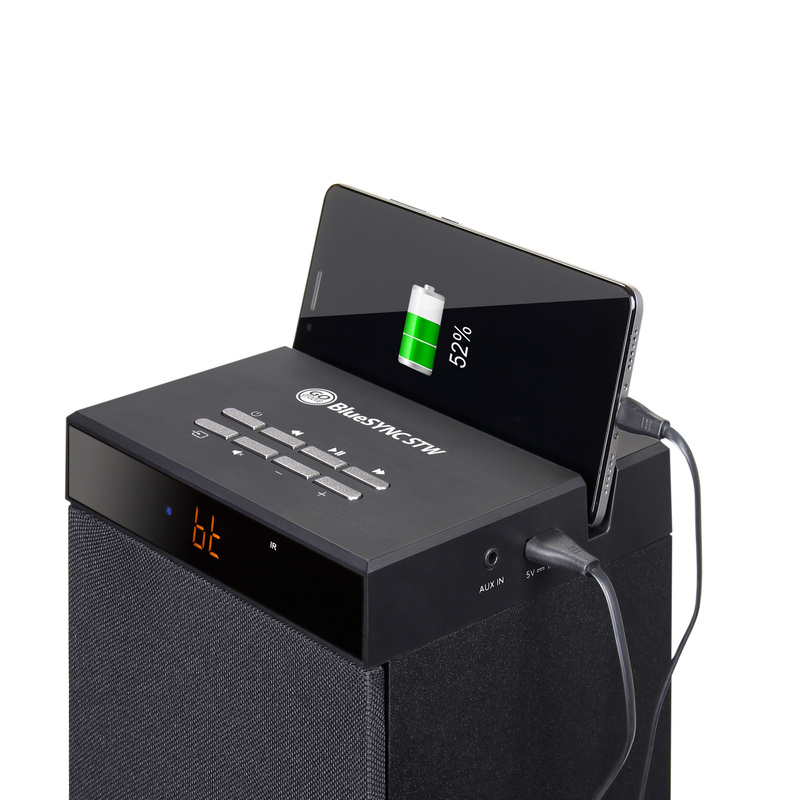 No need to fear finding your smartphone or tablet with a drained battery after streaming music. 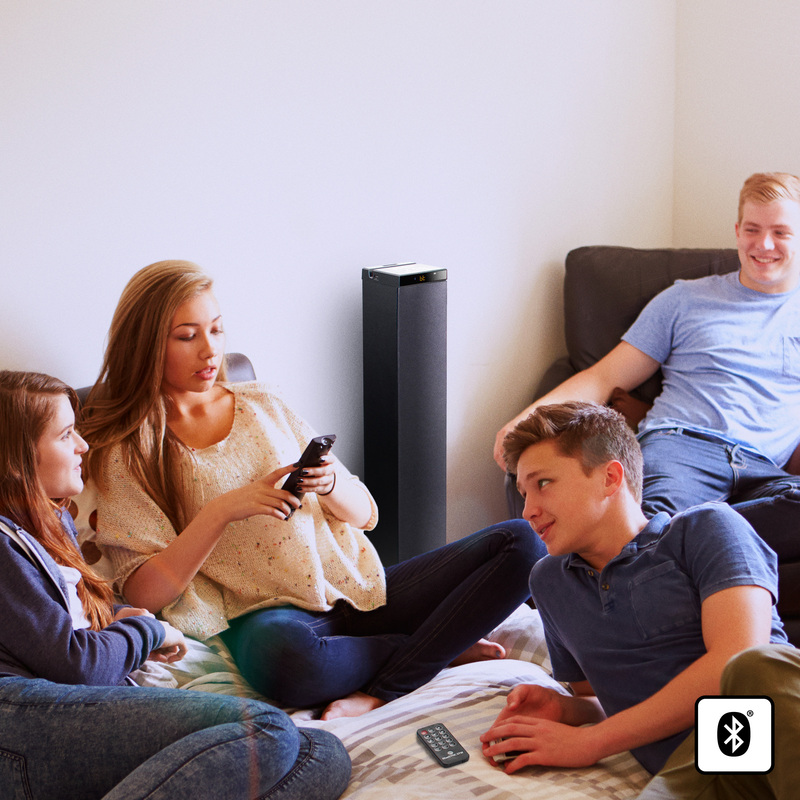 Keep your device charged by using its charging cord and plugging into the USB 2.0 port of the STW speaker. 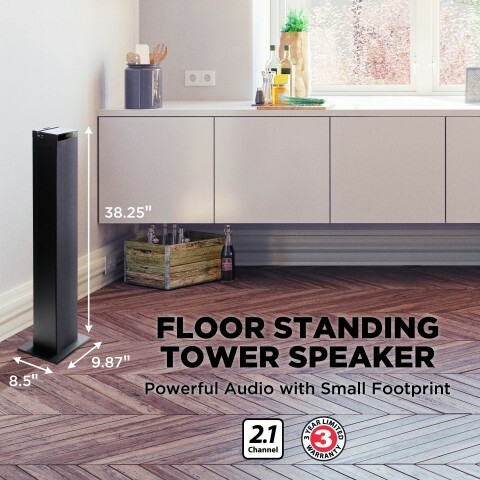 Any device that has a USB power cord and charges with 1A output can use the charging port, even if it is not the device actively playing audio on the STW tower speaker. 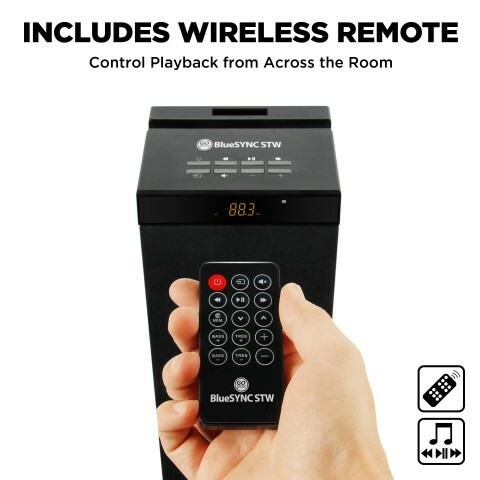 Use the included remote to control music and radio playback from the comfort of your bed or sofa. The remote is also used to access extra features like Bass and Treble level customization, and a memory function to scan and store available radio stations. When you’re done using the remote, place it in its dedicated slot at the top of the STW for easy access and safekeeping. Any device with Bluetooth capability can easily pair with the STW so you can stream your saved music library or queue up playlists and stations in your favorite music subscription app. If your car has Bluetooth or you own wireless earphones, this works the same way; simply pair devices once and control music from your smartphone or tablet. Keep your battery full and connect your device to the USB power port while you’re the acting DJ. If you prefer a wired connection, we include an 18-inch AUX cable to play audio from devices that do not have Bluetooth pairing (e.g. MP3 players, compact pico projectors, CD players, etc). 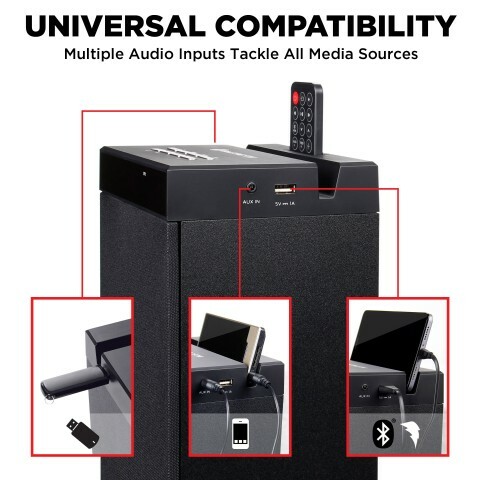 If connecting a tablet, smartphone, or MP3 player, you can dock the device in the cradle at the top of the STW so that it remains within easy access of the 3.5mm audio port. Media playback controls (Play/Pause/Previous/Next) do not work with the 3.5mm audio input, but you can still adjust volume, bass/treble, and mute using the remote control. 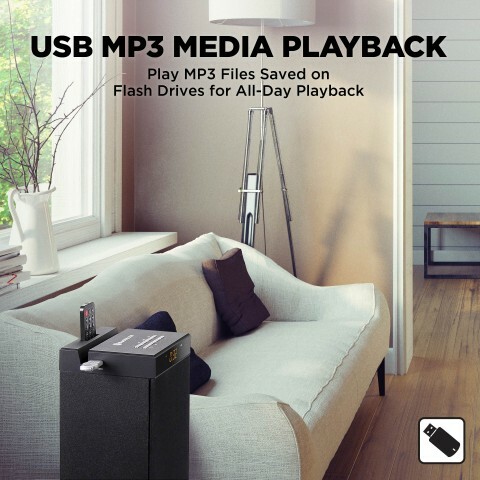 Load up .mp3 music files on a memory thumb drive (32GB or smaller) and connect it to the Flash Drive USB 2.0 port to instantly convert the BlueSYNC STW into an MP3 player loudspeaker. This is a great option when you have a library of hundreds of curated tracks that set a certain atmosphere or mood. You can control playback (Play/Pause/Skip) directly on the speaker or via the remote control. When you need ambient music, the STW’s MP3 player mode is the easiest way to just press Play and enjoy. 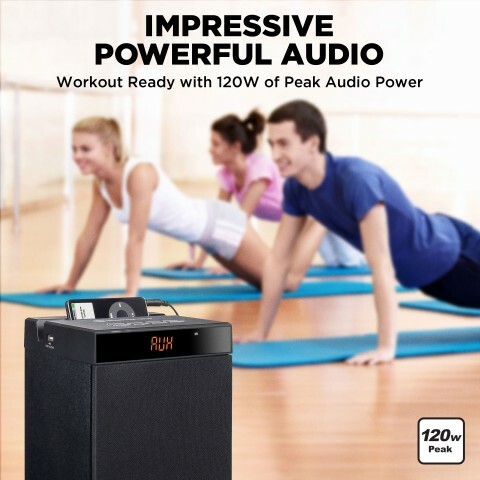 There are times the most convenient listening option is the one you can quickly turn ON and is ready to play. FM radio is freely available and does not require Wi-Fi or a cellular connection. 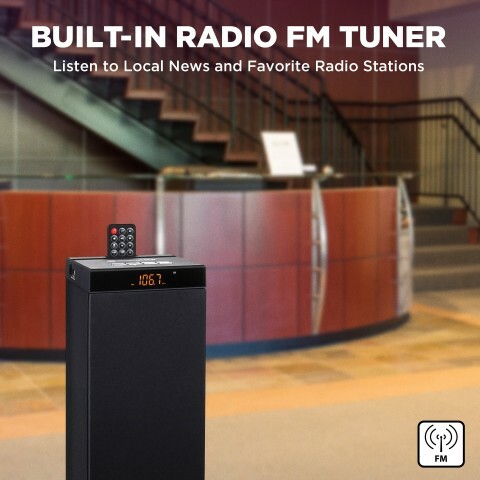 The BlueSYNC STW has a built-in FM tuner with a memory scan function to make tuning easier by storing locally available stations. If you’re part of the NPR loyal or appreciate the hands-off ease of listening to music on the radio, the STW was designed to deliver.